Fried chicken is definitely one of my favorite foods. And what’s not to love about it? It’s chicken and it’s fried! But the one thing I’m not a big fan of is how unhealthy it is for you, especially now when we’re all trying to watch what we eat. Of course, fried chicken is hugely popular all over Colombia, my favorite being Frisby’s, so I always have to have it whenever I visit. And did you know that they actually serve it with a pair of plastic gloves for you to wear while you eat it? I’ll explain that in more detail in a different post! 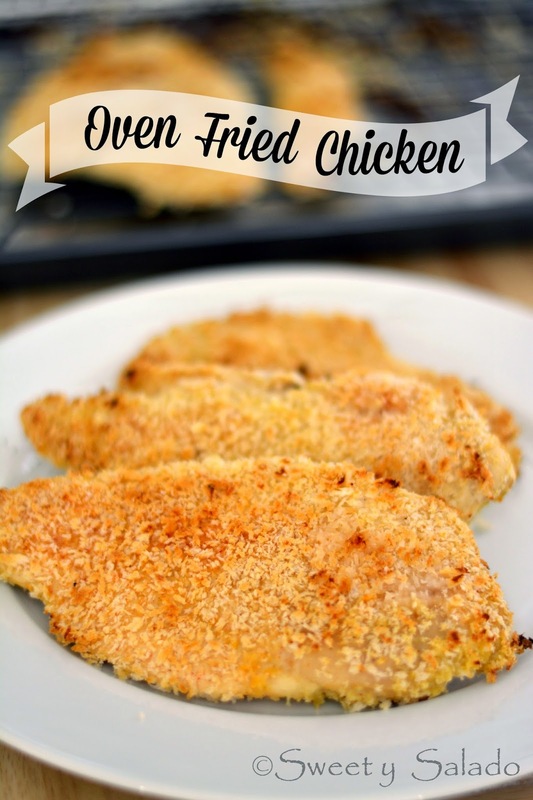 Since many of us are now trying to eat healthier after eating all kinds of high calorie, delicious foods during the holidays, I decided to post this oven fried chicken recipe, which I make a few times each month, to satisfy that fried chicken craving. It’s really easy to make, packed with flavor and the breadcrumbs really give it that fried chicken texture. Once you make it you will see that it’s really not that hard to eat a healthy and delicious meal any day of the week! Remove all fat from chicken breasts and butterfly it in half to end up with 4 thin pieces. Season both sides with paprika, onion powder, garlic powder, salt and pepper. Pour the buttermilk in a shallow baking dish, add the mustard, season with salt and pepper and whisk until well combined. Place the chicken in the buttermilk making sure it is well covered. Cover with plastic wrap and refrigerate for 30 minutes. Preheat oven to 350ºF (180ºC) and place a wire wrack on a baking sheet. Lightly spray the wire rack with oil. 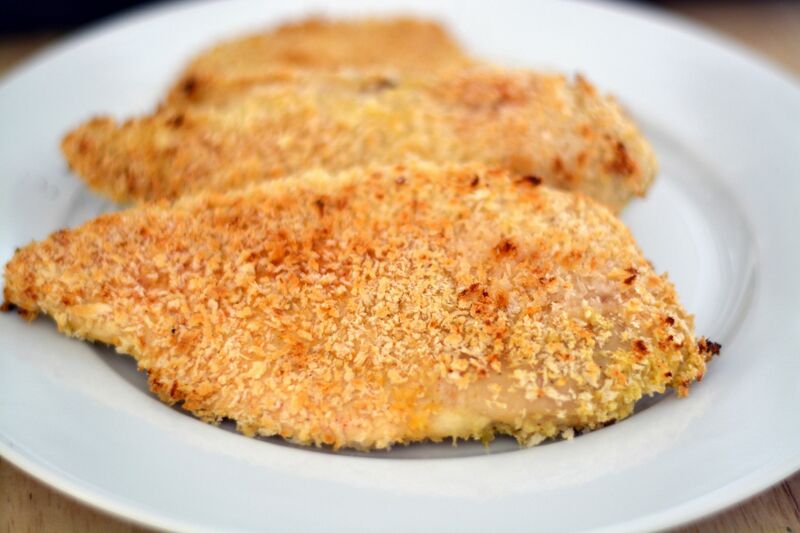 Place the panko bread crumbs in a shallow baking dish and season with salt. Remove the chicken from the buttermilk and dredge each piece in the breadcrumbs. Put the chicken on the wire rack and bake for 20-25 minutes or until chicken is cooked through. Turn on the broiler during the last 2-3 minutes of baking to give the crust a golden brown color. If your oven does not have a "broil" option, raise the temperature to 500ºF (260ºC).